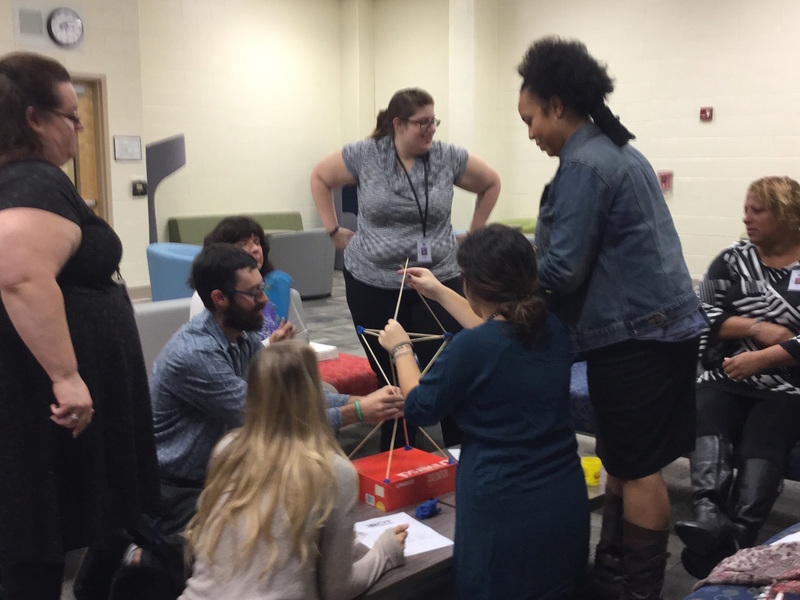 Tech Integration: Upon evaluation, the technology integration group decided that our after-school tech PD was ineffective due to lack of time (30 minutes or less). They decided instead to create a LMS that contains video of different technology being integrated in the classroom. Teachers can sign up to showcase a lesson. On that date, the classroom will be "open," meaning other teachers are free to stop down during their prep to observe the lesson. Additionally, a portion will be filmed for teachers who cannot visit the class, including an interview with the teacher. We are also debating having an outcome for the mini-lessons and providing micro-credentials to teachers who complete the modules. iBCIT Day: The TI group also decided to commandeer our 1/2 day PD in January. They will host a potluck lunch in our atrium. During lunch, we will have a tech-tool smackdown, presented by teachers, three minutes or less. After lunch, teachers will sign up to attend a technology PD presented by our teacher leaders. All sessions will be tech-related and teacher driven. All teachers will sign up for a workshop based on their interests and preferences. Though teachers can elect to sign up to lead a session, some will also be tapped based on classroom evaluations. Ok, so we have already been quite creative with our scheduling. We are currently running hybrid elective classes, and we are set to run a synchronous online portion of AP Literature and AP World History in February (see previous post). However, our creative scheduling was so successful that we wanted to review and expand on our offerings. The Creative Scheduling group, staffed with several science teachers, was tasked with looking at inquiry in our new science curriculum. We are in the process of redesigning our curriculum to include a STEM class freshman year and integrated units throughout the following three to four classes. All students will be completing four levels of inquiry based on the ELF Framework in each class. However, we wanted to create a designated "genius" hour within our coursework. 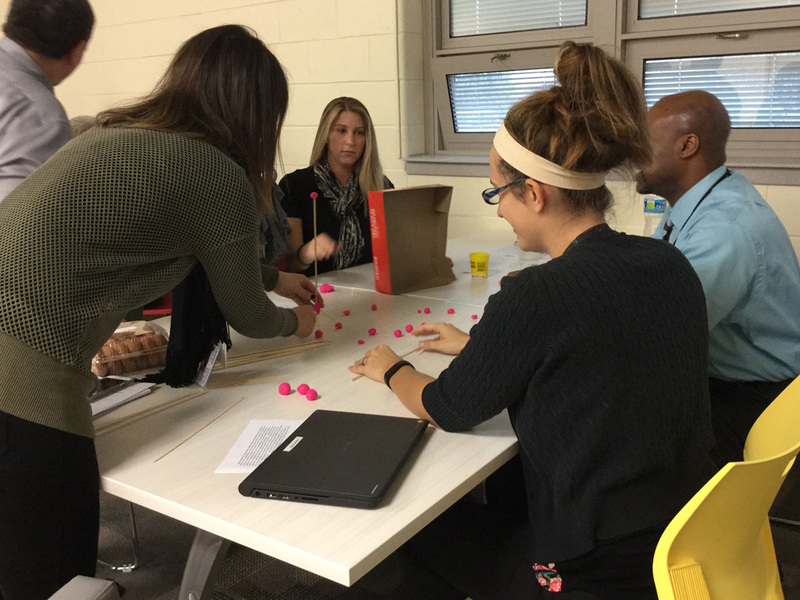 Working with consultants from Columbia Teacher's College and NJIT, our science teachers began to envision a student led program with problem-based learning. The creative scheduling group worked to refine these ideas and develop a protocol where inquiry could be independent, scaffolded, and meaningful. This curriculum and program will continue to be developed throughout the year for implementation in 2016-17. STEAM: Parents and children will take place in a program where they will design, scale, and paint a mural for our hi-tech lounge. The mural will be painted on 50 individual canvas frames and assembled by the team. We hope to have everything in place for a December, 2015 event. Maker Night: Parents and children will participate in our first maker night. We are currently researching our best options for an event like this, which is clearly somewhat different from a makerspace. We will be visiting some schools from InnovateNJ that have successfully implemented makerspaces to assist us with our evening event. This will likely be held later in the spring, possibly April. BCIT Reads: This event was actually planned by our BCIT Reads group for the parent involvement group. They designed an evening that built on and expanded our parent/child book club. Though we will still be reading literature and enjoying food, this time, we will enlist the author to join us for two evenings. One evening will be to discuss the book, and the other evening will be to discuss the process of publishing a book. This event is due to be held shortly after the holidays in January. Parent/Child Adventure Night: We have an adventure course in our gymnasium. Our team decided to hold a nutrition awareness night coupled with some team building activities in our adventure course. This event is planned for February. Carnival Night: Carnival Night is all about probability and statistics. Parents and children will participate in an event that features fun games along with learning about the potentials and probability for winning those game. This engaging event is planned for March. Our hope is that through a series of events that are appealing and lively, we will increase our parent involvement in school programs and the education of their children. BCIT Reads is a program that was implemented in the 2014-15 school year. During that year, we held the parent/child book club, posted READ @BCIT posters around the school, purchased high-interest classroom libraries and class sets of memoirs related to our CTE classes, and held drawings for students who completed independent reading. Our goal was to create a culture of reading within our schools. It was a very successful program. Students and faculty were reading together and discussing literature. Parents were involved along with their children. While I can't relate it to quantitative scores, the community embraced reading and teachers saw a marked increase in students completing independent reading. The new BCIT Reads group was tasked with reviewing and improving the program. The group decided that in addition to the popular READ @BCIT posters, they would designate an area of the school to "Caught Reading," where photos of students reading will be posted. The parent/child book club will run again this year, but this time, the author of the book will be involved. There will be two parent/child meetings. One will be discussing the themes of the text, and one will be on the process of publishing work. Both times, the author, a local writer, will assist. Lastly, they made plans to create vocabulary walls where Tier III words and definitions will be posted. The BCIT Reads group plans to meet again to further clarify initiatives. Once we had the first year under our belt, we were ready for the big time. We started by evaluating our first initiative, the hybrid electives. Student and teacher feedback regarding the program were strong- so strong, in fact, that we decided to expand our hybrid classes. Since we are on block scheduling, it is near impossible for us to offer a strong AP program. Our CTE classes demand any extra time. If we ran the AP classes for three marking periods, 80 minutes per day, students would only be able to take one AP class throughout their four years with us. We decided to make the third marking period an online, independent study class to remedy that. Students would meet in class for marking periods one and two, then pursue their independent study marking period three. During the third marking period, class meets twice weekly for online, synchronous sessions. In order to make this effective, we created units that were supportive of independent study. We also trained our teachers with Rich Kiker, a Google Education partner and eLearning expert. His workshop, Drive your Classroom, assists teachers with setting up their lessons and online meetings. The online portion of our AP classes are set to run beginning in January, 2016. We also created an innovative college-like space for learning. The room is modern, colorful, and outfitted with two Chromebook carts. Teachers can book the room during blocks 1,2, and 4. During block 3, the room is staffed by a certified math/English teacher. Students can receive a pass from a teacher to work in this quiet study room during lunch, assisted by a teacher. iBCIT wanted to expand the program and ensure that it was utilized and fully-staffed. We created the Genius Bar, a place where students can book peer-tutors during their lunches. The tutors receive volunteer hours, and the students receive assistance with coursework. Tech Integration: Plan, devise, and implement innovations in technology integration. Specifically, this group was to evaluate and update our Tech-Tool Tuesday's (weekly after school PD led by teacher leaders), and find new ways to support the use of instructional technology. Parent Involvement: Plan, devise, and implement a series of parent and community engagement nights. Because we draw from an entire county, we need to find extra-creative ways to encourage parent involvement. This group was to focus on these programs. Creative Scheduling: Evaluate and choose creative scheduling programs to implement in the coming year. We are currently rewriting our science curriculum to meet the Next Generation standards. 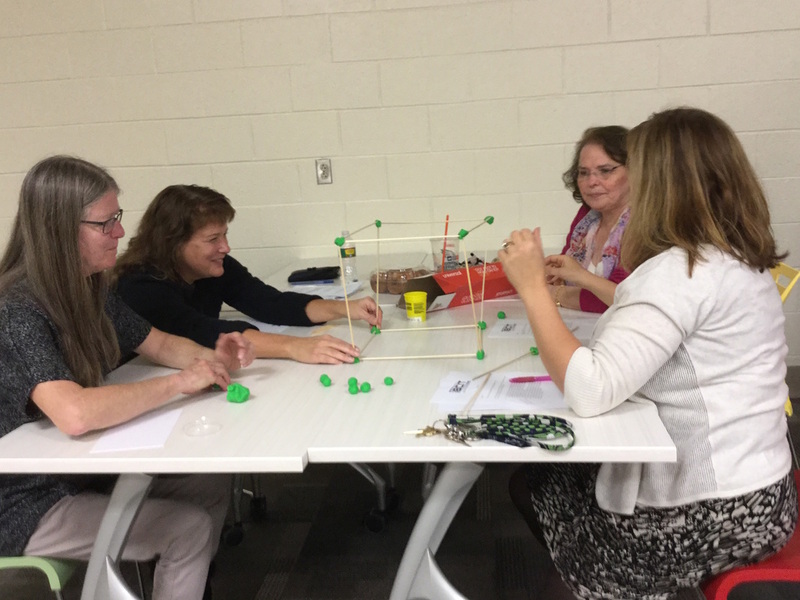 This group, which included several science teachers, were working on creative ways to implement these standards in the classroom, specifically inquiry-based learning. BCIT Reads: Plan, devise, and implement innovative literacy strategies. We try to build a culture of reading in our schools. BCIT Reads is an established program to build a community of readers. This group was evaluating plans in place and discussing options for improvement. In order to build collaboration and engage our creativity, we began our meeting with an competitive design activity (thanks to Long Branch!). Given a set of supplies, each group competed to build the highest structure possible (in ten minutes). What a great way to begin a meeting! The teams had fun and teams built collegiality. Parent Engagement won the contest by a long shot, but all teams enjoyed the experience. Once we finished our contest, we got down to work. I circulated among the groups to assist with questions and focus goals; the teachers did the hard work. Our outcomes will be posted in future entries. Our school joined InnovateNJ last year, a consortium created by the NJDOE to join like-minded schools and create a culture of progressive, leading-edge schools in our state. Our challenge in participating is to collaborate with our partner school, pioneer new programs, and report out on our processes and outcomes. ​Last spring, we started our InnovateNJ program. The first thing we did was to create a brand (thanks, Voorhees!). After soliciting participants, we held our first meeting at our Westampton Campus. There were twelve teachers involved. We decided to brand ourselves iBCIT (InnovateBCIT). Our advertising, art, and design students created a logo for our group. Once we had our logo, we set to work on a project the consortium tasked us with, Option II. How could we create innovative scheduling options? As a Career and Tech school, we have no room for electives since the career majors utilize all elective time. Still, we knew that many of our students were moving on to college and had interests in addition to their chosen major. We decided to run a series of four elective classes, two in the fall, and two in the spring. These classes would utilize a hybrid schedule, meeting once per week after school for two hours, and once per week in the evening for a synchronous online discussion, much like contemporary college classes. Once we worked out the details, we had staff members submit proposals for electives. In total, we received 22 proposals for everything from Women's Issues to Forensic Science to Issues in Black Culture. In turn, we sent the proposals out to the students in a two-question survey. 1) Would you be interested in participating in a hybrid course? 2) If you are interested in a hybrid course, which one is most appealing? The results of the survey were overwhelmingly positive; over 90% of those surveyed were interested in participating. The most popular proposals were Human Behavior and Forensic Science, which we decided to run in Fall 2015. In order to ensure equity, we ordered a set of 40 laptops to be issued to students participating in a hybrid class. The Chromebooks would be kept by the students for the semester. In July, we held our breath and sent home the application information. Yes, the students expressed interest, but would they follow through and take the classes? Immediately, the applications began pouring in. Human Behavior was the most popular. In fact, it was so popular that the class filled and there were students on a waiting list. This prompted a phone call to another qualified teacher of the subject; would he be interested in running a fall course? He agreed, and we opened [and filled] a second section. In the meantime, Forensic Science also filled. All three classes had waiting lists. ​In August, we briefed teachers on setting up an online course. Our tools for the program were Google Classroom, Communities, and Hangouts. We discussed expectations, rules and timing. We created attendance policies and project or inquiry based units. We recognized that in order to make these classes a success, we needed to capture students' interest with engaging, student-led classes. Much of the work is collaborative in nature, and the online component is mostly utilized for small group discussions and reporting on research. As we near the end of the first marking period, I can say that the classes have been quite successful. There was very little attrition, though we lost 2-3 students initially due to schedules. We replaced those students with others on the waiting list. The students are engaged and active, and somehow, we managed to entice students to extend their learning beyond the traditional school day. Burlington County Institute of Technology.